← Celebrating 80 Years of Conservation! An over capacity crowd filled Fenton City Hall to find out what, if anything, is being planned to help reduce the continued severe flooding events. Two 500 year floods have devastated residents and business owners in the local area recently. 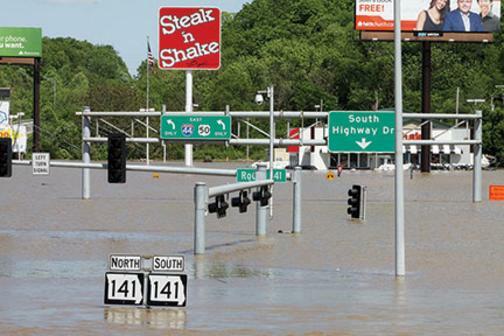 Both flooding events happened within 18 months of each other. Many from the community asked questions, voiced concerns and frustrations directed at city officials until the Fenton Mayor Josh Voyles adjourned the meeting. A few of the ideas brought up included questions about restarting the Meramec Dam project, dredging the Meramec River to make it deeper and wider, and also the feasibility of possible European flood protective measures. Fenton officials had invited several experts to speak at the July 19 meeting. The organizations included FEMA, National Weather Service, Department of Natural Resources, Fenton Fire Protection District and the US Army Corps of Engineers. However, the resources did not get to address the crowd of more than 250, but instead answered questions outside the meeting room. Read more about the Fenton special community meeting from the South County Times HERE. Also, watch for Environmental Echo’s podcast interview with Executive Director of Great Rivers Habitat Alliance David Stokes in August. The Great Rivers Habitat Alliance is actively involved with questioning city officials about the recent historic flooding and working to find solution oriented changes to help protect the environment and local communities.